« Impatica viaDock is receiving excellent feedback from our user community! 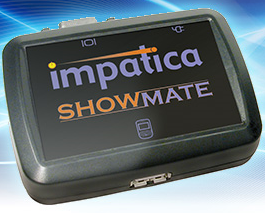 Impatica ShowMate is compared to RIM’s BlackBerry Presenter in BMQ’s Tech Blog. Screen contents from BlackBerry smartphones with BlackBerry OS 4.2.2 or later and from Windows Mobile devices. Both USB and Bluetooth projection capable. Useful when security protocols do not allow for Bluetooth projection. Simply attach the ShowMate to the VGA port of any projector or monitor and your handheld delivers your PowerPoint presentation wirelessly using Bluetooth technology. You can now roam the stage and interact with the audience to deliver a more engaging presentation, without being tethered to a laptop. In fact, you can now travel laptop free!